Kagome would giggle and slightly blush at Kouga's nuzzle. Kagome would grip onto Kouga as he sprinted off. "So how has the pack been??" Kagome asked trying to start a conversation.
" eh actually my tribe was wiped out by naraku. Only I, ginta,hakaku, is the pack. But you joined." he says with a warm smile as he held onto her tighter so he won't drop her or anything as he sprinted past trees. "aw i'm sorry and yeah i joined!" Kagome said first with an apologetic look but the smiled at the fact that she was with Kouga's pack. Kagome blushed knowing what Kouga ment by new members but a slight smile appeared on her lips. 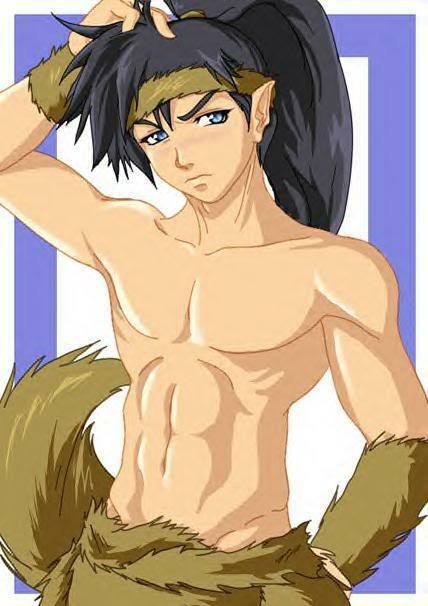 As she was set down off of Kouga's back Kagome looked up at her Wolf Prince. ( x33 ) Hearing there was a storm coning, Kagome nodded her head as she headed inside. Kagome sat down on the fur coats tucking her green skirt under her. She loosly wrapped her arms around her knees as she leaned her chin on top of her knees. She blushed at the question but she wasn't gunna deny the fact that she had thought about it before, so she wasn't that surprised at the question. "As long as they're your pups I would care if they were human or demon or half demon..." Kagome let out smiling. "Although, I don't think I'm ready to have pups just yet..." Kagome stared at the fire that Kouga had made as the color of the flames light reflected in her eyes. Her chocolate brown eyes soon drifted from the fire towards where Kouga was sitting.